Stand Up Paddle Boarding Battle Ground Lake is a great place for newbies wanting to get their feet wet, or experienced paddle pro’s looking for some nice chill time on the water. Surrounded by picturesque deep woods, the lake is almost always nice calm waters suitable for paddlers of all skill levels. There’s a large roped off swim area for the kiddos to play in and adults to lounge in. A nicely groomed walking trail circles the lake, with picnic benches and water access spots dotted along the way. Nice restrooms down closer to the water and primitive bathrooms up by the parking areas. The spring fed lake is stocked with trout, making it a popular destination for anglers and a great place to try Stand Up Paddle Board fishing for the first time! There are NO motorized boats allowed! If you are using a trailer to launch, please be aware the launch area is a very tight fit and not suitable for larger trailers. Trailers will also need to be parked at the large gravel lot nearest the highway entry, which is quite the walk back down to the water. A Discover Pass is required for all vehicles entering the park. There is an automated pay station on-site, so no worries if you forgot to grab a Pass. Battle Ground Lake is open to Paddle Boarders from 6:30am – Dusk in the Summer and from 8am – Dusk in the Winter season. The 275 acre park surrounding the lake is very popular with horse riders and even includes equestrian camping spots, so be prepared to share the trails & parking with those folks and as always be cautious and polite around horses. There is ample parking year round, although on a busy weekend you can expect a fairly long hike from your vehicle to the water. You’re welcome to drive down to the launch to drop off your paddle boards before parking. 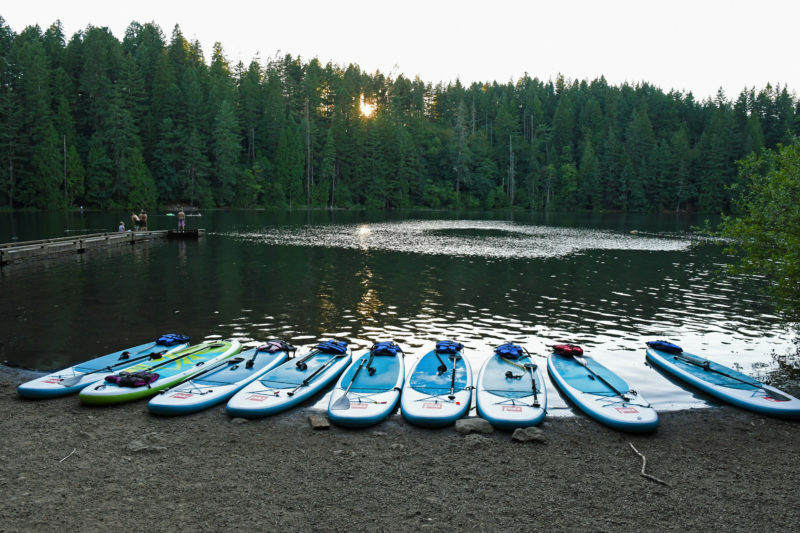 Discover paddle boarding Battle Ground Lake, a smaller paddle board destination, but a beautiful lake and well worth a quiet relaxing paddle. 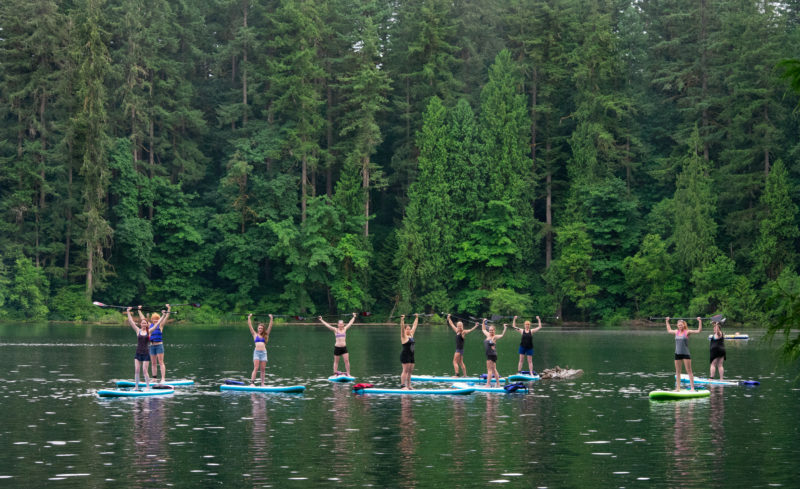 The calm waters are great for beginner paddlers and are often used by NW SUP & Fitness for our Paddle Fit Classes! NOTE: As with many of the lower elevation lakes, it is advised to check for any algae or bacteria warnings before planning your paddle trip to Battle Ground Lake!